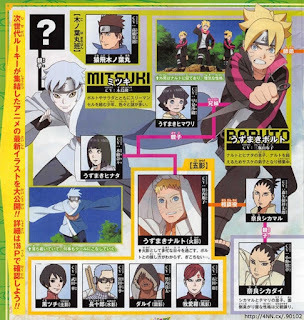 The latest issue of Weekly Shonen Jump features images revealing new cast members from Boruto: Naruto the Movie. 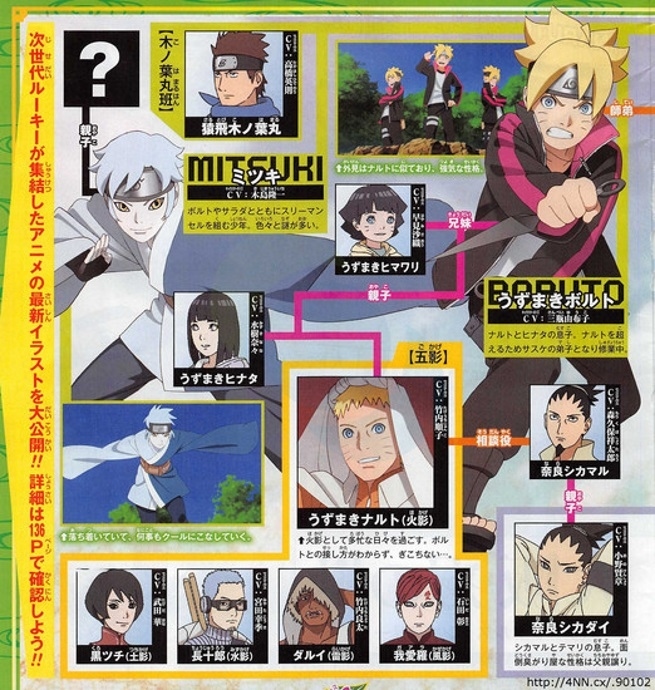 The lead role of Boruto will be played by Yuko Sanei, and Sarada will be played by Kokoro Kikuchi. 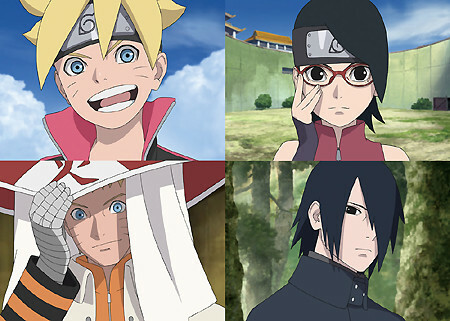 Junko Takeuchi will reprise his role as Naruto Uzumaki, and Nariaki Sugiyama will return to play Sasuke Uchiha. Shueisha's Weekly Shonen Jump magazine gave a tagline for the film, "The curtain rises on the legend that will surpass all!!" The tagline in the visual above is, "Surpass the legend. Take the reins of the new era." 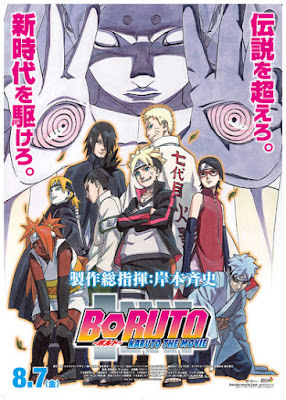 Original Naruto manga creator Masashi Kishimoto is credited with the original story, script, and character designs, as well as the chief production supervisor, for the film. 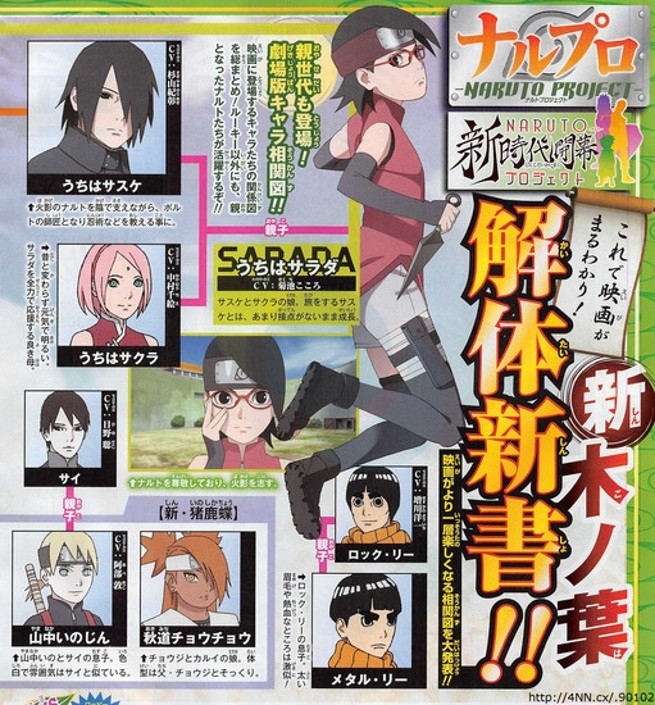 Hiroyuki Yamashita (Naruto Shippūden episode director, Road to Ninja: Naruto the Movie animation director) is directing the film, and Ukyō Kodachi (Chaos Dragon, Neppu Kairiku Bushi Road) is collaborating with Kishimoto on the script. The film will open in Japanese theaters on August 7, and tickets went on sale on June 27. Theatergoers will be able to choose one of two fans designed by Masashi Kishimoto as a special gift. 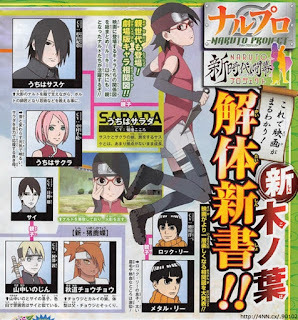 The "Uzumaki Version" will feature Naruto and Boruto and the "Uchiha Version" will feature Sasuke and Sarada. The fans are limited to 100,000 units. Those who watch Boruto -Naruto the Movie- in theaters throughout Japan in August will receive 2 million copies of an official book — one with a brand-new one-shot manga by original manga creator Masashi Kishimoto. 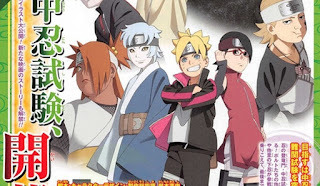 The Naruto Hiden Zai no Sho Official Movie Book's title indicates that the book is a spinoff of the Naruto: The Official Character Data Book series. The book will debut the manga short "Naruto ga Hokage ni Natta Hi" (The Day Naruto Became the Hokage) that Kishimoto personally drew. 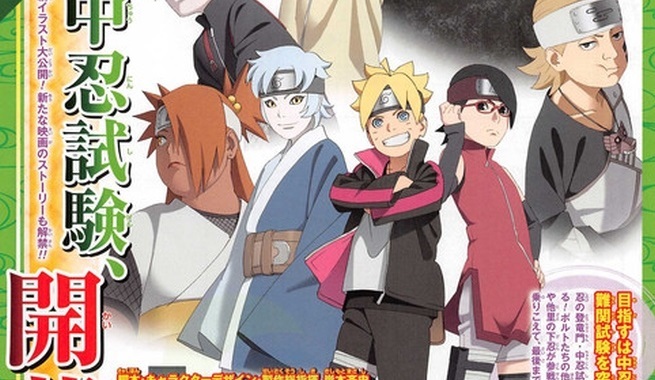 The story episode did not appear in the main Naruto manga's original run. The book will also include the main manga series' 700th and final chapter in full color. Viz Media has licensed the film for a North American release. 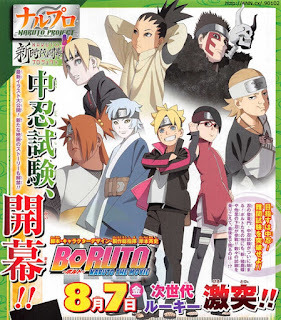 Boruto: Naruto the Movie will open in Japanese theaters Aug.7.